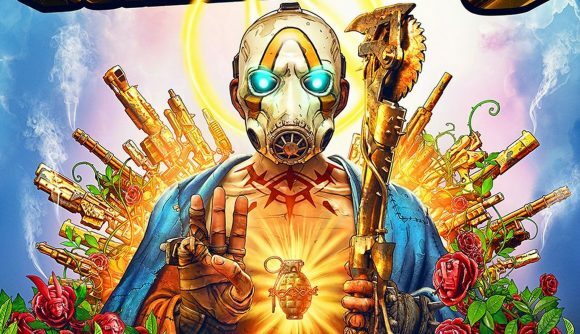 Borderlands 3 was announced last week, and while the reveal stream wasn’t exactly seamless, we learned that we’d be finding out more about the game today. Last night, however, an advert for the game appeared on Youtube, seeming to reveal its cover art, as well as a release date and Epic Games store exclusivity. The advert text is in French, although it’s not too tricky to decipher what it means. It reveals the names of the Borderlands 3 vault hunters – Moze, Fl4k, Amara, and Zane – as well as its enemies, the Calypso Twins. It also confirms that there’ll be new worlds to discover, lining up with leaks that suggested we wouldn’t be limited to Pandora in the new adventure. The end of the advert shows what seems to be the game’s cover art, a religious-themed image of an NPC surrounded by guns and roses (although with no official link to the famous band). The weapons are likely a link to the one billion guns that the game is said to feature, while the roses feature the faces of the characters set to appear. That religious theme, if you weren’t aware, is a nod to the cult that the Calypso Twins seem to have started up. It also flashes up a date – September 13 – which is likely to be the Borderlands 3 release date, and closes on a screen with logos from publisher 2K, developer Gearbox, and the Epic Games store. While nothing’s been confirmed, that’s likely to mean a period of exclusivity around the game’s release. Gearbox CEO Randy Pitchford has previously expressed tacit support for the new storefront, so if true, this isn’t likely to come as a massive surprise. Obviously it’s worth taking this new leak with a pinch of salt, but many of the details line up with what we’ve already learned about the game. Either way, we’ll find out more about Borderlands 3 later today, so keep a look out for more info.